After the amazing sell out response to RandLAN #39, this event will be even bigger. RandLAN is back for the last time in 2018 and is planning to go out with a bang. Play all your favourite PC games and win some prizes as a PC Player ticket holder or chill out with some consoles with our Guest pass. 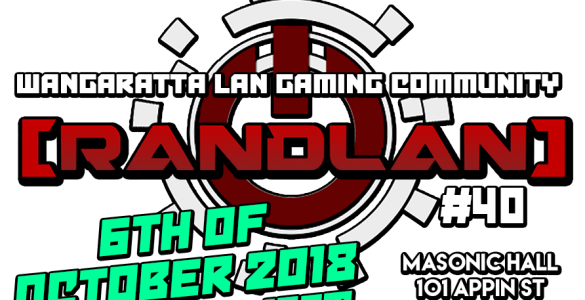 For the first time RandLAN will also be hosting Tabletop games for all to enjoy. Never played before? Everyone is welcome. Don’t miss this fantastic event! You can find a full timetable of the event at the link below! Snacks, soft drinks and coffee will be available to purchase during the event. Dinner will be supplied by Appin Street Takeaway, food ordering forms will be distributed at the event and are required to be returned by 5pm. Pizza also available on request. If there are any questions please see out “Contact Us” page for more information.